This is something frustrated frequent fliers will find hard to believe. A new survey of the world's largest airlines finds carriers have increased the percentage of flights with seats available for reward travel. In fact, the annual Switchfly Reward Seat Availability Survey found 74percent of the flights checked have seats open for reward reservations. "What I am surprised by is that we continue to see improvement year over year," said Jay Sorensen, President of IdeaWorks which conducted the survey in conjunction with Switchfly. "When we did this in 2010 we saw 66 percent overall reward availability and now we are up to 74 percent." That is the highest level of reward seat availability in the six years the survey has been conducted. Sorensen thinks three factors are pushing airlines to free up more reward seats. First, competition from credit cards like Capital One, which offer reward bookings without blackout dates, may be forcing airlines to make more seats available so airline frequent flyer programs are more attractive. Second, new accounting rules mean airlines can recognize some reward program revenue only after reward travel has been taken, so there's an incentive to redeem frequent flier miles. Finally, Sorensen thinks airlines may look to eventually spin-off their frequent flyer programs. If that happens, investors will scrutinize not only the financials but also how attractive frequent flier programs are for members. "I think over the next five years we might see some of the major airlines spinning off their programs in the U.S.," Sorensen said. "The airlines do want to make them (frequent flier programs) look appealing in terms of investor results." So which airlines have the most flights with reward seats open? Switchfly says Southwest and the German discount carrier Air Berlin had reward seats available on every flight checked. They were followed by Virgin Australia, Air Canada and Singapore. The three largest airlines in the U.S., American, Delta and United all increased their reward seat availability. 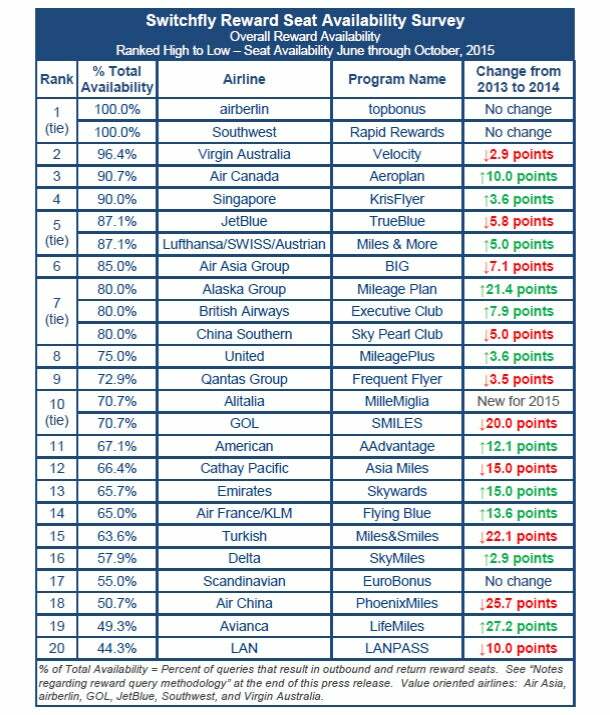 Meanwhile, airline showing the biggest improvement in open reward seats was Alaska. Switchfly found 80 percent of Alaska Airline flights had seats open for bookings under the company's Mileage Plan program. Caroline Boren with Alaska Airlines says the carrier has been more aggressive freeing up seats for frequent fliers, even if that means taking away seats that might be sold. "There's a short term financial benefit to selling a seat, but there's a long-term benefit to having loyal customers if you open seats for frequent flier rewards," she said. Alaska's improved results in the latest Switchfly survey come one day after the airline's Mileage Plan scored highest in J.D. Power's latest report on airline reward program customer satisfaction. Even with this study showing more seats are open for reward redemption, many travelers question if frequent flier programs are rewarding enough members. Both Delta and United have changed their programs in the last year so miles are accrued based on how much money people spend on tickets, not on how far they fly. These Were the Top 5 Most Disrupted Airline Routes in 2017. Here's What to Consider in 2019. Did Ann Coulter's Twitter Tirade Break a Law?